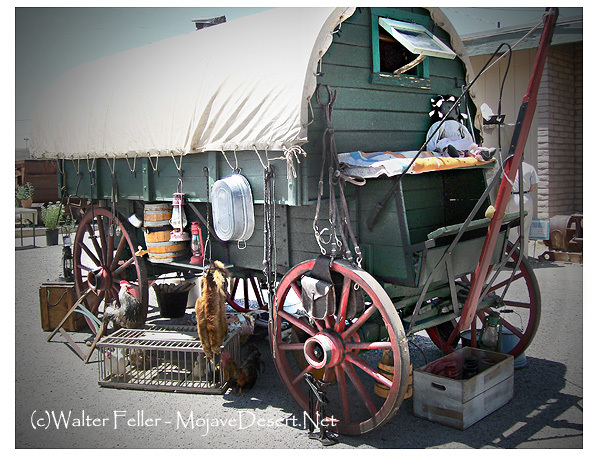 There were those wishing to settle in the new lands of California, they came in wagons with their families. After Edward F. Beale rode to the east with news of the discovery of gold, hundreds and then thousands came across the Mojave, at first along the Old Spanish Trail. Mormons made significant use of the trail and variations became known as the Mormon Trail. Wagon parties of note during this period were the Bennett-Arcane party and Rose-Bailey. Bennett-Arcane had decided to try an ambiguous short-cut which ended in stranding them in Death Valley without food or ample water. The Rose-Bailey party was attacked by Mohave Indians while attempting to cross the the Colorado River. Lives were lost and the Rose-Bailey party made the long trek back to Sante Fe. The 'Lost 49ers,' as the Bennett-Arcane party became known, were rescued by the heroic efforts of two of its young members, William Manly and John Rogers. Although the massacre of the Oatman family occured far to the south, Olive and Maryann Oatman were held as slaves by the Mohave Indians for several years. Maryann died of malnutrition during a famine, and Olive Oatman was eventually rescued.